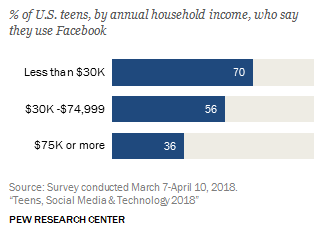 A Pew survey on teens and the way they use technology has revealed that children have largely abandoned Facebook for the visually stimulating Snapchat, YouTube and Instagram alternatives. Almost half said that they are "almost constantly" online, which is likely to be used as a source of FUD, but is really good. Even teens, bless their honest little hearts, have doubts about whether social media is good or bad. The poll is Pew's first since 2015, and a lot has changed. The biggest change seems to be the ubiquity and power of smartphones, to which 95 percent of respondents had access. Less, especially among low-income families, had laptops and desktops. This mobile-native cohort has opted for mobile-native content and apps, which means they are very visual and easily searchable. This is much more the style of the top 3 apps: YouTube occupies first place with 85 percent, then Instagram with 72 percent and Snapchat with 69. Facebook is still far away with 51 percent Of the 71 percent who used it in 2015, when it was by far the top of the heap. Interestingly, the average of 51 percent is not representative of any of the surveyed income groups; Thirty-six percent of higher-income households used it, while 70 percent of low-income households did. What could explain this divergence? The latest and best hardware is not needed to run the top 3 apps, and (necessarily) no expensive data plan. Since there is no data for the surveys and no young people are asked nearby, I leave this to the professionals who should take a closer look. No doubt, Facebook will be interested in learning this, but I'm sure I know who I'm joking about. (19659002) Twice as many teenagers claim to be "online" all the time, but it's hard to say when one of us really is "offline." Teens do not literally look at their phones all day long. It seems like that too, but they – and the rest of us – are rarely more than a second or two away from checking messages, checking things out, and so on. I am surprised that the number "constant" is not higher, honestly. When asked if social media is one have positive or negative effect, teenagers were separated. They appreciated it for connecting with friends and family, found news and information, and met new people. But they decry his use in bullying and spreading rumors, his intricate impact on personal relationships, and how it distracts and distorts real life. Here are some quotes from real teens showing real insight. "I believe that social media can make people of my age feel less lonely or alone, creating a space where you can interact with people . " " My mother had to go to the library to be in my hands all the time, and she reminds me a great deal. " " We can more easily connect with people from different places and become bigger Ask for help through social media that can save people. " "People can say what they want with anonymity, and I think that has a negative impact." "Gives people a bigger audience Hate to talk and teach and to offend each other. "It makes it harder for people to socialize in real life because they have become accustomed to not interacting with people. " " Because teens kill people because of the things they see on social media, or because of things that happened on social media. The last one is scary.